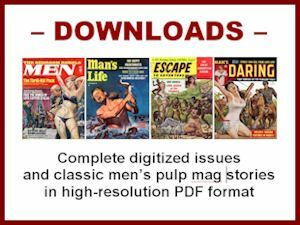 Ken for Men was one of many postwar men’s magazines published by pulp mogul, Martin Goodman. 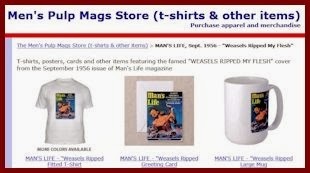 It was one of his “Diamond Group” of men’s mags, along with Stag, Male, Men, Man’s World, For Men Only and others. 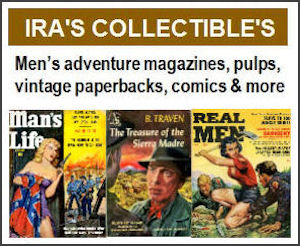 Goodman also published prewar pulp mags, pulp fiction paperbacks and comic books – including the original Marvel Comics, which his Timely Publications company created in 1939. His in-house comics staff included comics legends Joe Simon and Jack Kirby, creators of Captain America and other still-cool superheroes. One of his editors was the equally legendary Stan Lee. Stan created Spider-Man (among others) and later took over Marvel, turning it into the awesome Marvel Universe it is today. It’s supposedly the “true” tale of an ex-RAAF pilot named Chris Hansen. In 1946, he and two buddies crash landed in the jungles of New Guinea. One buddy was killed in the crash. Hansen and the other expendable buddy were captured by a tribe of cannibals (hence the use of the term “Long Pig,” a local euphemism for human flesh). The article includes what is said to be a pre-crash photo of Hansen and his buddies, next to a pic of the some of the guy cannibals. Of course, as former Goodman editor Bruce Jay Friedman noted in his book Even the Rhinos Were Nymphos: Best Nonfiction, credibility-enhancing photos for the “true” stories in men’s adventure magazines were often just totally unrelated pics from some stock photo service. Anyhoo, – ***SPOILER ALERT*** – the buddy who survived the crash gets butchered alive, then cooked and eaten. But Hansen gets lucky, in more ways than one. Instead of ending up as dinner, he gets sexually harassed by the cannibal Amazon babes (as shown in the gorgeous duotone below), then makes a miraculous escape and lives to tell his tale – to Ken for Men magazine. 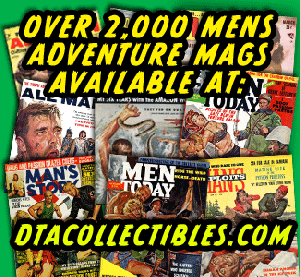 Hey, true or not true doesn’t really matter in the Men’s Pulp Mag Zone. 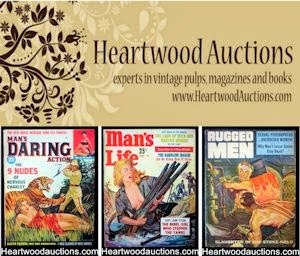 The great artwork and cannibals + nymphs storyline makes “Shotgun Husband of the Long-Pig Amazons” a true men’s pulp mag masterpiece. It would make a cool really Quentin Tarantino movie. In fact, Inglourious Basterds is a lot like a men’s pulp mag story.